As you probably know, SQL Server Express doesn’t ship with SQL Server Agent. This is a known limitation and many people offered alternative solutions to schedule jobs, including windows scheduler, free and commercial third-party applications. It uses msdb tables to read job information. This means that jobs, schedules and the like can be scripted using the same script you would use in the other editions. It’s open source and it was started by a person I highly respect. It’s still a beta version and the project hasn’t been very active lately. There’s no GUI tool to edit jobs or monitor job progress. The UAC problem during installation is easy to solve: open an elevated command prompt and run the installer msi. Easy peasy. As far as SQL Server 2012 is concerned, the service fails to start when connected to a 2012 instance. In the ERRORLOG file (the one you find in the Standalone SQL Agent directory, not SQL Server’s) you’ll quickly find the reason of the failure: it can’t create the stored procedure sp_help_job_SSA. I don’t know why this happens: I copied the definition of the stored procedure from a 2008 instance and it worked fine. If you don’t have a SQL Server 2008 instance available, you can extract the definition of the stored procedure from the source code at CodePlex. Error connecting to SQL Instance. No connection attempt will be made until Sevice is restarted. However, you’ll probably notice that the SQL Server service account does not have sufficient rights to restart the service. The following PowerShell script grants the SQL Server service account all the rights it needs. In order to run it, you need to download the code available at Rohn Edwards’ blog. $ServiceAcl = Get-ServiceAcl "Standalone SQL Agent"
After running this script from an elevated Powershell instance, you can test whether the startup stored procedure has enough privileges by invoking it manually. If everything works as expected, you can restart the SQL Server Express instance and the Standalone SQL Agent service will restart as well. In conclusion, Standalone SQL Agent is a good replacement for SQL Server Agent in Express edition and, while it suffers from some limitations, I still believe it’s the best option available. One of the tasks that I often have to complete is manipulate some data in Excel, starting from the query results in SSMS. Excel is a very convenient tool for one-off reports, quick data manipulation, simple charts. 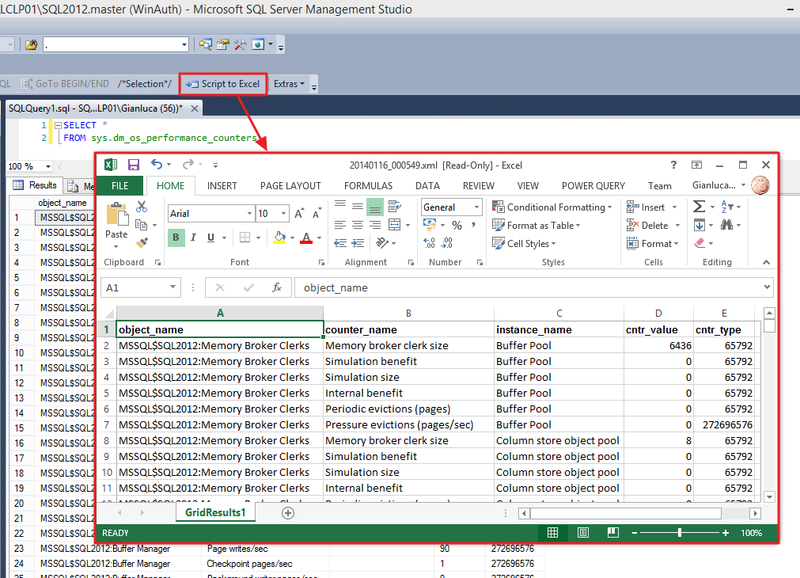 Unfortunately, SSMS doesn’t ship with a tool to export grid results to Excel quickly. Excel offers some ways to import data from SQL queries, but none of those offers the rich query tools available in SSMS. 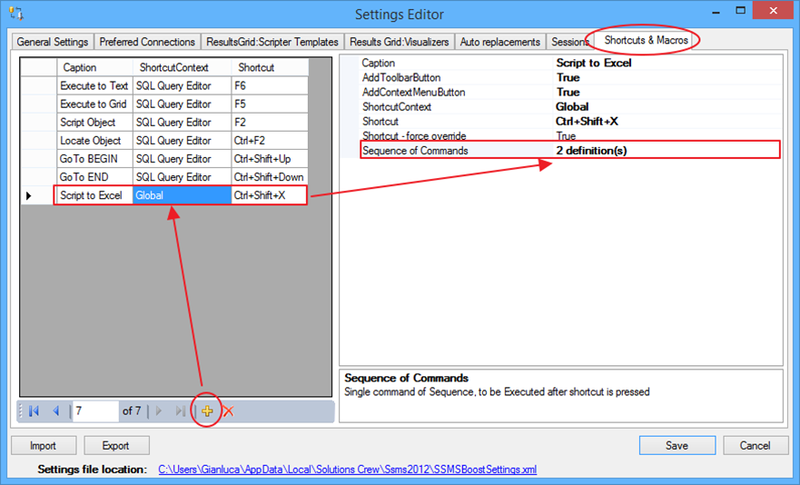 A representative example is Microsoft Query: how am I supposed to edit a query in a text editor like this? Actually, there are many ways to export data from SQL Server to Excel, including SSIS packages and the Import/Export wizard. Again, all those methods require writing your queries in a separate tool, often with very limited editing capabilities. PowerQuery offers great support for data exploration, but it is a totally different beast and I don’t see it as an alternative to running SQL queries directly. How can I edit my queries taking advantage of the query editing features of SSMS, review the results and then format the data directly in Excel? The answer is SSMS cannot do that, but, fortunately, the good guys at Solutions Crew brought you a great tool that can do that and much more. SSMSBoost is a free add-in that empowers SSMS with many useful features, among which exporting to Excel is just one. I highly suggest that you check out the feature list, because it’s really impressive. Once SSMSBoost is installed, every time you right click a results grid, a context menu appears that lets you export the grid data to several formats. No surprises, one of those formats is indeed Excel. So, where is the single click I promised in the title of this post? The good news is that SSMSBoost can be automated combining commands in macros to accomplish complex tasks. 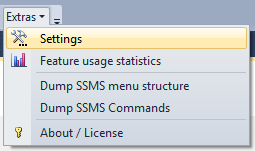 First, open the SSMSBoost settings window clicking the “Extras” button. In the “Shortcuts & Macros” tab you can edit and add macros to the toolbar or the context menu and even assign a keyboard shortcut. Select “Add” and choose the following command: “SSMSBoost.Connect.GridDataCopyTemplateAllGridsDisk3”. 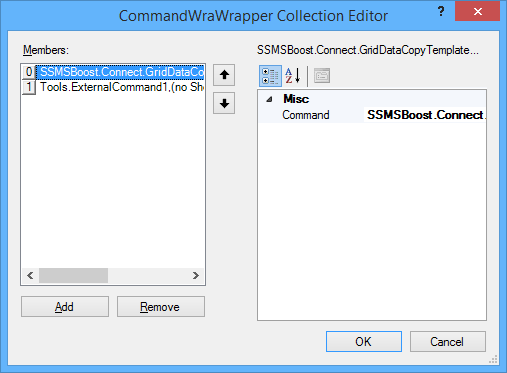 This command corresponds to the “Script all grids as Excel to disk” command in SSMSBoost. That button allows to export all grids to Excel in a single click. You’re almost there: now you just need something to open the Excel file automatically, without the need for additional clicks. To accomplish this task, you can use a Powershell script, bound to a custom External Tool. Click OK to close the External Tools editor. 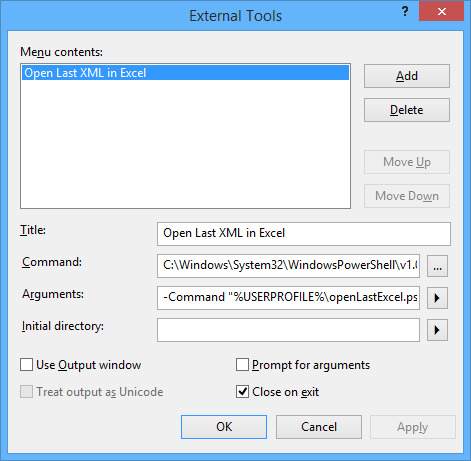 This command lets you open the last XML file created in the SSMSBoost output directory, using a small Powershell script that you have to create in your %USERPROFILE% directory. # Sorry, I could not find a registry key to automate it. $fileToOpen = "`"" + $fileToOpen + "`""
Now you just have to go back to the SSMSBoost settings window and edit the macro you created above. In the definitions field click … to edit the macro and add a second step. 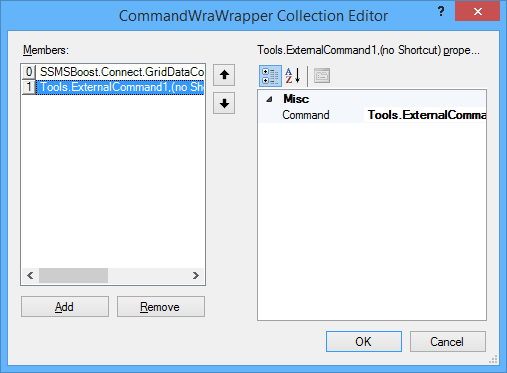 The Command to select is “Tools.ExternalCommand1”. Save and close everything and now your nice toolbar button will be able to open the export file in Excel automagically. Yay! If nothing happens, you might need to change your Powershell Execution Policy. Remember that SSMS is a 32-bit application and you have to set the Execution Policy for the x86 version of Powershell. Starting Powershell x86 is not easy in Windows 8/8.1, The documentation says to look up “Windows Powershell (x86)” in the start menu, but I could not find it. The easiest way I have found is through another External Tool in SSMS. Start SSMS as an Administrator (otherwise the UAC will prevent you from changing the Execution Policy) and configure an external tool to run Powershell. Once you’re in, type “Set-ExecutionPolicy Remotesigned” and hit return. The external tool in your macro will now run without issues. Nothing compares to SSMS when it comes down to writing queries, but Excel is the best place to format and manipulate data. Now you have a method to take advantage of the best of both worlds. And it only takes one single click. Sometimes you have to copy all user databases from a source server to a destination server. Copying from development to test could be one reason, but I’m sure there are others. Since the question came up on the forums at SQLServerCentral, I decided to modify a script I published some months ago to accomplish this task. $BackupFile = $DatabaseName + "_" + $ts + ".bak"
$SQL_BackupDatabase = "BACKUP DATABASE $DatabaseName TO DISK='$BackupPath' WITH INIT, COPY_ONLY, COMPRESSION;"
Write-Output "Database backed up to $BackupPath"
Write-Output "Moving $remotesourcefile to $sharedFolder"
$SQL_RestoreDatabase += " MOVE '$($CurrentRow.LogicalName)' TO '$NewName'"
Write-Output "invoking restore command: $SQL_RestoreDatabase"
Write-Output "Restored database from $RemoteBackupPath"
Write-Output "Deleting $($sharedFolder + "\" + $BackupFile) "
It’s a quick’n’dirty script, I’m sure there might be something to fix here and there. Just drop a comment if you find something. If you are adopting Sql Server Data Tools as your election tool to maintain database projects under source control and achieve an ALM solution, at some stage you will probably want to import all your databases in SSDT. Yes, it can be done by hand, one at a time, using either the “import live database” or “schema compare” features, but what I have found to be more convenient is the “import dacpac” feature. Basically, you can extract a dacpac from a live database and then import it in SSDT, entering some options in the import dialog. The main reason why I prefer this method is the reduced amount of manual steps involved. Moreover, the dacpac extraction process can be fully automated using sqlpackage.exe. It’s a very simple script indeed, but it saved me a lot of time and I wanted to share it with you. Unfortunately, there is no way to automate the import process in SSDT, but looks like Microsoft is actually looking into making this feature availabe in a future version. Recently I had to implement log shipping as a HA strategy for a set of databases which were originally running under the simple recovery model. Actually, the databases were subscribers for a merge publication, which leaves database mirroring out of the possible HA options. Clustering was not an option either, due to lack of shared storage at the subscribers. After turning all databases to full recovery model and setting up log shipping, I started to wonder if there was a better way to implement it. Log shipping provides lots of flexibility, which I didn’t need: I just had to ship the transaction log from the primary to a single secondary and have transaction logs restored immediately. Preserving transaction log backups was not needed, because the secondary database was considered a sufficient backup in this case. Another thing that I observed was the insane amount of memory consumed by SQLLogShip.exe (over 300 MB), which ended up even failing due to OutOfMemoryException at times. After reading Edwin Sarmiento‘s fine chapter on SQL Server MVP Deep Dives “The poor man’s SQL Server log shipping”, some ideas started to flow. And then I just needed a PowerShell script to do the heavy lifting. I think the code is commented and readable enough to show what happens behind the scenes. $BackupFile = $DatabaseName + "_" + $ts + ".trn"
$SQL_BackupDatabase = "BACKUP LOG $DatabaseName TO DISK='$BackupPath' WITH INIT;"
Write-Output "LOG backed up to $BackupPath"
Write-Output "Moving $BackupPath to $sharedFolder"
Write-Output "Restored LOG from $RemoteBackupPath"
Write-Output "Expiring backup set $BackupPath"
The script can be used in a SQLAgent PowerShell job step and it’s all you need to start shipping your transaction logs. Obviously, you need to take a full backup on the primary server and restore it to the secondary WITH NORECOVERY. Once you’re ready, you can schedule the job to ship the transaction logs. You may be surprised to know that not all keyboard layouts include the backtick key, and if you happen to live in a country with such a layout and want to do some PowerShell coding, you’re in big trouble. For many years all major programming languages took this layout mismatch into consideration and avoided the use of US-only keys in the language definition. Now, with PowerShell, serious issues arise for those that want to wrap their code on multiple lines and reach for the backtick key, staring hopelessly at an Italian keyboard. The only way to type a key not present in your keyboard layout is using the numeric pad with the ALT key, so that, for instance, backtick becomes ALT+Numpad9+Numpad6. This method is painful enough itself, but quickly becomes a nightmare when working on a laptop, where probably there’s no hardware numeric pad. This way, backtick becomes NumLock+ALT+Numpad9+Numpad6+NumLock. OMG! 5 keys instead of 1! No way: we need to find a workaround! If I can’t type the backtick directly, I can always build a small application that types that key for me. Even better, I could unleash my google-fu and find a ready-made one, such as Independent SendKeys. Now I just need to associate this command with one of the keys on my keyboard. To change the behaviour of one of those keys, you just have to open the registry and navigate to HKEY_LOCAL_MACHINE\SOFTWARE\Microsoft\Windows\CurrentVersion\Explorer\AppKey. Typically, you should find 4 or 5 subkeys, that identify what Windows will do when one of those keys gets pressed. With this registry hack in place, whenever you press the e-mail key, SendKeys types a backtick on the active window. Mission accomplished? Not completely: the e-mail key is not easy to use, because it was not meant for typing and you will probably find it slightly out of reach. To type the backtick more easily, you need to immolate one of the other keys and make it act as if it was the e-mail key. In my case, the perfect candidate for the sacrifice is the ScrollLock key, which I don’t remember having used in 20 years. I’m sure I won’t miss it. To teach Windows to swap the keys I would need to apply another registry hack, but it’s too complicated to use and explain, especially because there’s a nice little application that can do that for me. 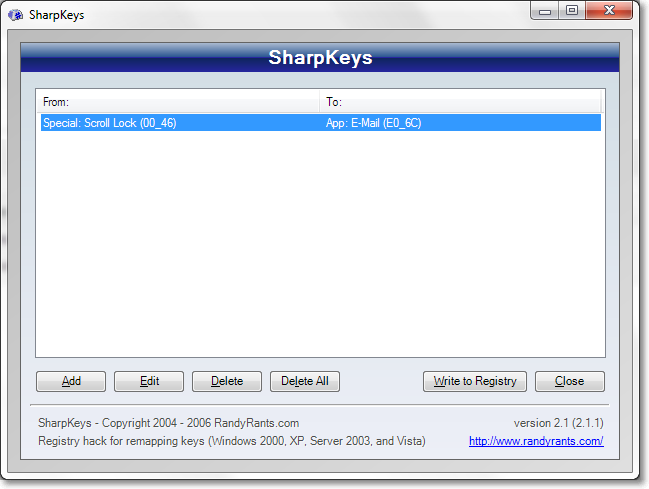 SharpKeys is an application that can remap the keyboard and make a key act as if another key was pressed instead. It does not need to run in background or start with windows, because it’s just a user friendly interface for a registry hack. Once the hack is active, you can even uninstall it if you like. In this screen capture, I set the ScrollLock key to act as the e-mail key. As you can see, SharpKeys always assumes you are using the US layout and displays the key accordingly, but the important thing is that it can recognize the correct scancode and remap it to the e-mail key. The nice thing about this hack is that you can use it even if you don’t have the mapped key in your keyboard. In fact, on my laptop there’s no e-mail key at all. After rempapping the keys, Windows will start typing backticks whenever you press the ScrollLock key. Now you can focus on Powershell itself, not on memorizing ASCII codes! EDIT 20/09/2011: In the first version of this post I suggested remapping the e-mail key to the § symbol (which is probably the most useless key on my keyboard), but, actually that would have mapped the WHOLE key, thus loosing the ability to type the “ù” char. That’s why I changed this post and decided to remap the ScrollLock key instead. My apologies to those who followed my advice and lost their “ù”. EDIT 21/03/2019: The Microsoft Keyboard Layout Creator can help you create a custom keyboard layout that contains the backtick character mapped to any key combination you find appropriate. Go give it a try.